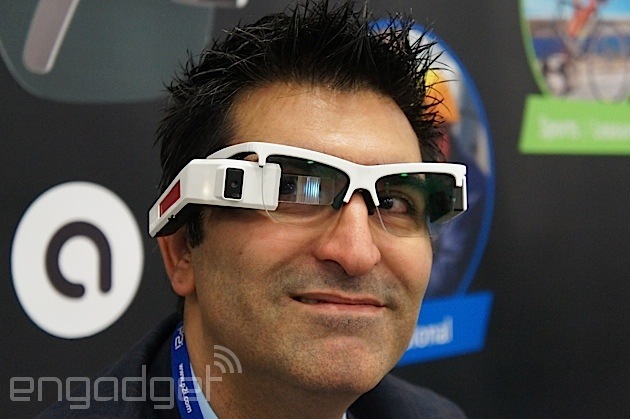 We are excited about Optinvent new wearable tech similar to Google Glasses but at a better price point! Optinvent Unveils the Ultimate Smart Glass Platform for App Developers and Consumers ! wearable computing applications.” The ORA-­‐1 runs standard Android apps – just like any standalone Android smartphone or tablet device – and includes the Wikitude AR browser for an Augmented Reality experience out of the box. ORA-­‐X The ORA-­‐X is the more streamlined consumer version that pushes the technology envelope. It’s based on the same cutting edge technology and specifications as the current ORA-­‐1, but in a much more streamlined package and for only $300! This is by far the most affordable smart glass device ever announced, finally taking this emerging category mainstream. On the hardware side, specifications include: • A front-­‐facing 1080p 5 mega-­‐pixel camera • A 9-­‐axis motion sensor • Wireless connectivity (Bluetooth, Wi-­‐Fi, GPS) • A trackpad (mouse and swipe) for tactile interactions with the device • A high capacity Li-­‐Ion rechargeable battery (7 hours of typical use) • And a powerful dual core microprocessor with enough memory to support complex applications. “Flip -­‐Vu” dual-­‐mode display for Augmented Reality and Glance Vision T he revolutionary “Flip Vu” display enables both an “augmented reality” mode -­‐ the image is directly in the wearer’s field of view, but without disrupting it -­‐ and a “glance” mode (the image is just below). “In the AR viewing angle, digital information is overlaid on the wearer’s environment, enabling true augmented reality applications, while in Glance mode, the display is positioned below the field of view – a much more natural position than if it was above – enabling quick information snacking,” added Mirza. Optinvent has also extended its partnership with Himax Display, a leading manufacturer of LCOS micro-­‐display panels for head-­‐mounted devices, for this next-­‐generation of ORA eyewear. The ORA-­‐1 comes pre-­‐loaded with Android 4.4.1 (Jelly Bean) and a complete software development kit (SDK) for developers. The ORA-­‐1 developer version sells for $599, while the consumer ORA-­‐X will be released mid next year, for as low as $300 and is now available for pre-­‐order on Kickstarter! For more information on the ORA Kickstarter campaign, please visit https://www.kickstarter.com/projects/optinvent-­‐ora1/ora-­‐1-­‐smart-­‐glasses-­‐developer-­‐version About Optinvent Optinvent is the world leader in digital eyewear/Smart Glasses and see-­‐through retinal projection technology. Optinvent’s team has 20+ years of experience in the field of consumer electronics and is recognized in the industry for developing cutting edge patented technologies and products. Be the first to comment on "We are excited about Optinvent new wearable tech similar to Google Glasses but at a better price point!"